Thanks it was very useful answer to my question of how to easily seperate the hard moong beans that are not hydrated, as they were plenty when compared to the hydrated ones in my case. Mrs. V: It is no fun to chew on hard beans. I hope the floating trick worked for you to separate the sprouts from the duds. I have a theory as to why some bags of the Mung sprout well and others do not; seeds from a newer crop sprout better than the old ones. I love cooking but I have never been able to sprout the beans. Please could you send me some advice on sprouting them. I used to see my mum sprous Val on a tray with a cloth on top. It doesn't work for me thus if you could please give me some tips I would really appreciate it. I am sorry that it took me so long to respond to your query; I had not seen your comment until today. But to answer your question, see if you can follow the directions in my post; sprouting is quite an easy and rewarding activity. Just try it first and let me know if you come across any troubles are I will be happy to help. You are welcome Bharti; I am glad this post was useful for you. Keep sprouting :)! Thanx for the post. i didn't know sprouting was so easy! Thank you for leaving a comment. Making sprouts really is easy as you can see. Happy sprouting to you :)! Thanks so much for info on sprouting. Do mung beans need to be sprouted in darkness? Why do my mung bean sprouts go redish? Hello Mairead, Sprouting does not require darkness. 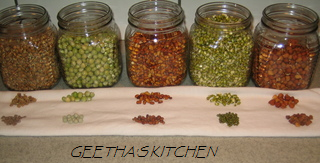 I keep the sprouts in glass jars on the kitchen counter just as you see in the picture. The jars are covered loosely with a lid or a piece of cloth. I am not sure why your mung beans turn reddish - I've never seen that happen. Thank you for stopping and leaving a comment. Happy cooking & sprouting!! Can you sprout any kind of bean such as ones that have been put up with oxygen absorbers? Dale, I believe that beans stored with oxygen absorbers should sprout just fine as the purpose of the O2 absorber is to prevent spoilage, bugs, etc. Hi, Nice post on sprouting. I tried in this way. Cloth/paper towel used became brown/reddish brown [like apple turned brown when exposed to air], BUT NOT on the sprouts. Wondering what is the reason. please let me know. Hi Seetha, Thank you for the comments. I am guessing that cloth or paper towels turn brown when sprouting on them because the color may bleed from the skins of some beans or from the dust/dirt on them. Some deep colored beans and peas will color the soaking water even after thoroughly washing. The other reason for the brown stain could be from mold or spoilage if all the materials are not kept pristine; hence the need for clean equipment and rinsing with clean water. I find sprouting to be one of the most fun and rewarding experiments in the kitchen. Happy sprouting! Hello Anon, I am glad this post has been helpful. Thank you for your comments. Happy cooking! Anon, Yes, all those sprouts should be good and good for health too. I have never sprouted urad dal though. Also, I prefer to sprout various seeds separately as each may require different amount of time to sprout. Hello,how does one sprout when it's so hot.I find the sprouts start smelling bad if left on the kitchen counter when it is very hot,say 40*c. will sprouting take place in the fridge? would it be a good idea to add some salt to the overnight soaking beans? Cyanide issue - I had to research it before answering - the sources that I checked said that cyanide is present in minuscule amounts in some beans and one would have to eat pounds and pounds of sprouted beans at a time for it to reach toxic levels. The only grain that would pose a threat is sorghum which apparently could contain lethal amounts when sprouted. So, sprouted beans and peas and most grains are safe for consumption. About using wheat for sprouting - I typically don't sprout wheat. You could try sprouting a small quantity of the available wheat to see if they grow. If they don't, wheat specifically marketed for sprouting is available for purchase. Happy sprouting!! Sridhar, Sprouted beans and peas are good sources of protein - 20-26 % - (some contain all essential amino acids), fiber, Vitamins A, B, C,E and K, minerals such as iron, calcium, potassium, magnesium and phosphorus and antioxidants. Happy sprouting! indeed i am thankful for your reply regarding cyanide in sprouts and is a good explanation. Dear Anon, Glad to be of help :). Itz was nic to see your post.i love cooking and to be innovative in kitchen with natural ingredients.i have been preparing Sprouts part 2years and was successful with greengram,chick peas, brown chick peas.but could not sprout Red Kidney beans and Black eye Beans.should they soaked for long time.? Plz let me knw. Is the process for sprouting peas the same for fresh peas as it is for dry peas? Or can I skip the soaking part and go right into the sprouting part? Hi Diana, I am glad you have enjoyed the information and recipes. To answer whether Butter/Lima beans can be sprouted, yes they may be sprouted but should be cooked before eating - similar to kidney beans as you said. Hi Geetha I have tried sprouting bean several times and each time the beans have a semll, I rinse them twice a day in a strainer and then place the strainer in a larger bowl and cover with a cloth.Only a handful of the kidney beans have a tail and there is a weird smell, should i throw them out and what am i doing wrong? Hello Bea, I hope you are not planning on eating Kidney beans as fresh sprouts! I do not sprout them since I do not eat them as fresh sprouts so am not sure why they smell strange. If you do not see any mold or other signs of spoilage, the sprouted beans need not be thrown away but may be cooked before eating. Happy cooking! Okay! thank you for your reply, I was sprouting them to use in a soup. What is the best way to sprout the beans, clearly my using a strainer in a bowl isn't doing a good job! And I am assuming normally there should be no smell? Also why did some beans have a tail and others none? Hello Bea, You are right that the sprouting beans should not have an offensive odor. Please read the post for your questions regarding sprouting; as I mentioned in the post, I think old beans do not sprout easily or quickly whereas the newer ones sprout fast. Any container should work as long as all the steps are followed. Happy sprouting! Hello , while we sprouts green gram it will smells badly after one day . why it is happening and how to increase shelf life of sprouted green gram. Hello Asif, Make sure you have a clean jar or bowl and rinse the Mung thoroughly; keeping everything very clean will prevent spoilage and resulting bad smell. Once sprouted, rinse and drain thoroghly every day and store the sprouts in the fridge. Happy, successful sprouting to you!